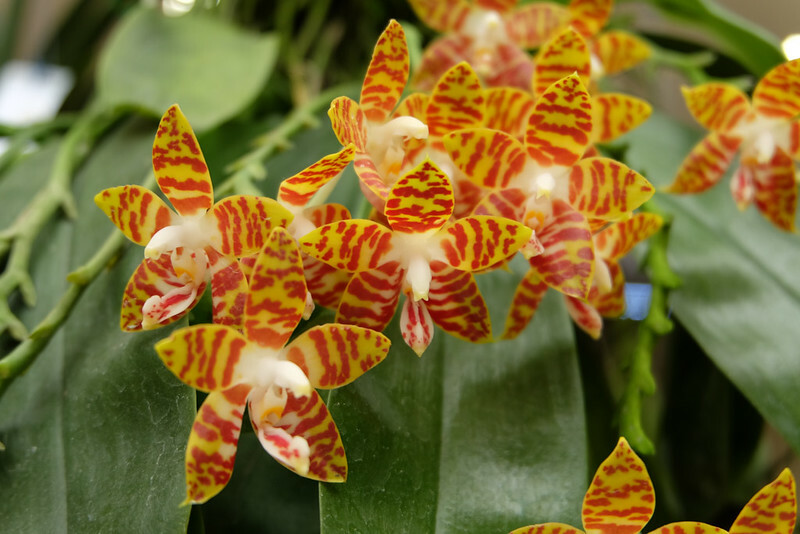 I keep coming back to pictures of Phalaenopsis amboinensis because this species remains strongly as one of personal favourites. I’ve posted one here before but this specimen hits a home run for being extraordinarily spectacular. 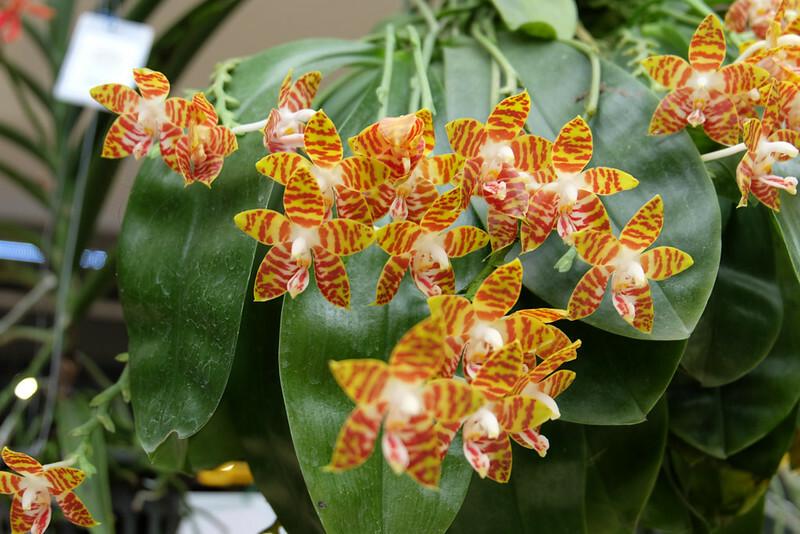 Close to 30 striped, star-shaped flowers fall gracefully just over the edge of the lush, green leaves of this Phalaenopsis amboinensis. The flowers have a yellow base, which I’ve read, is a well heritable trait. Perhaps this ‘heritability’ can come my way, toward my home that is. As you’re aware, it’s only a few more days to the new year, and the next horticultural fair is a few months away. I’m sure I could pick one up there, if my budget allows (as if that has ever been an issue!). In the meantime, I’ll get ready the space in preparation for the Stripey One. It has been long overdue. I won’t say anymore and let these pictures do the talking. Super stripes! Awesome amboinensis here to brighten up the day. Although there are only a few flowers at the end of each spike, there are multiple spikes, contributing to the high and impressive flower-count. Who needs a pot? Just a stump will do. Check out those adventurous roots! 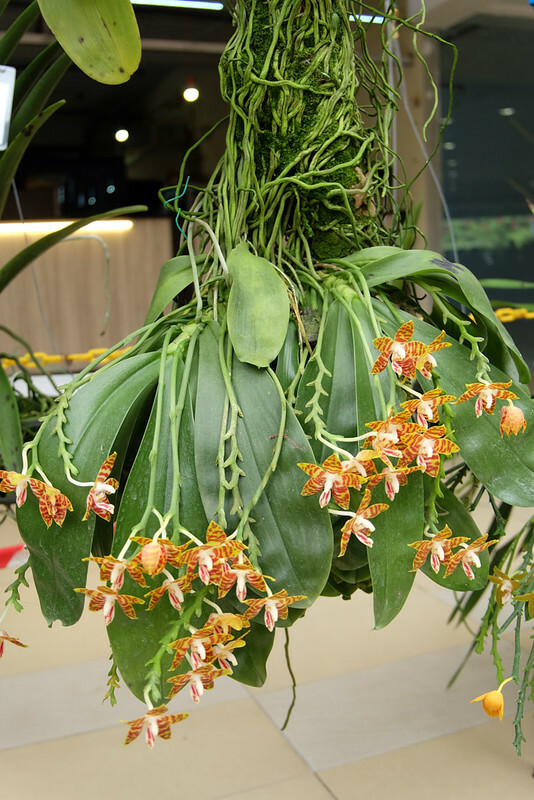 There is some opinion about how algae on orchid roots might inhibit optimal absorption of water or nutrients. I don’t think the green algae’s a problem here. If anything, shows that light and humidity levels are right.